Whether they're an oenophile or a novice, no wine lover's home bar is complete without these essential wine tools. Held in a stylish and compact leather case, this eye catching gift is perfect for celebrating, congratulating, rewarding or thanking. Patented Ratchet-Action Corkscrew with Complimentary Engraving. Stainless Steel Drip Ring and Bottle Stopper. Gift arrives presentation-ready in our signature gift box. A free card with your personal message is included with your gift. Top handle of the corkscrew can be engraved with 1 to 2 lines, with a maximum of 15 characters per line. Complete the personalization option during the checkout process. Measures 8" x 3" x 3". Stainless Engraved Wine Tool Set is a hand delivered gift. These gifts are delivered by one of our local design centers located throughout the United States and Canada. Same day delivery is available for most gifts when ordered before the cutoff time. The cutoff time for Stainless Engraved Wine Tool Set is 2 PM in the recipient's time zone. Complimentary engraving on the corkscrew's top handle. Complete set of wine tools including stopper and drip ring. Arrives presentation-ready in our GiftTree signature gift box. I did not see the gift as I had it sent directly to my friend for her birthday as it would be the perfect accompaniment for her newly created bar. She absolutely LOVED it, and it arrived as promised. Great quality, great gift, great customer service and quick delivery as promised. I had the best gift ever, everyone was fighting over it. We played the white elephant game where one person could take the other persons gift depending on the number you have and it was hilarious how everyone wanted this gift. I had it engraved "2018 Friends For Live Gift Exchange". It was a bit hit. Will definitely be ordering again, I have placed this site in my favorites. Thank you. This elegant wine bottle opener was a well-received gift for my daughter and son-in-law's eleventh ("steel" ) anniversary. I very much appreciated the free engraving and the very prompt service. Thank you all. Thank you for allowing our gifts to arrive just in time. My daughter and her husband loved it! A perfect 3rd anniversary gift. Due to a "series of unfortunate events" I ended up realizing on 12/23 that I had forgotten to get a gift sent out to my father for Christmas, who lives in another state so I desperately went out in search of a miracle. 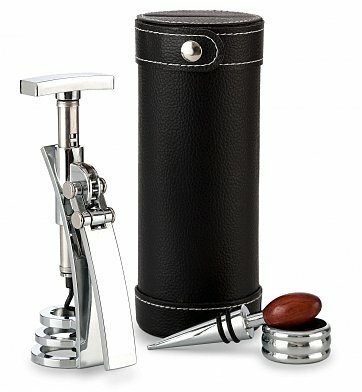 I found this site, and ended up finding this set which looked perfect for my Dad and his wife who are wine aficionados. I had it engraved, and paid a relatively reasonable upcharge for *next day delivery* which actually *WAS* delivered the very next day, with the engraving! My Dad was very happy with it and I looked like a hero. Christmas Miracle, indeed! Thanks! Gave this to a friend with her initials engraved. She loved it! It's a great way to personalize a gift for a wine lover at a very reasonable cost. Me encanto, es mejor de lo esperado, muy buena calidad. I ordered this three days before a first anniversary. I was unsure of the expected delivery date, but decided to chance it. My son said it not only arrived on time but was extremely nice and of good quality. I will be ordering from Gift Tree again! The quality is quite good and the packaging is very nice. I was amazed that a personalized gift would arrive so quickly! I would recommend this website to others looking for something special. The only thing I cannot attest to is how long it lasts as it was just purchased. Bought for our 3rd wedding anniversary gift (leather) and we are also wine lovers!! I was very pleased with the easy ordering and the exceptional delivery time. I placed my order on April 22nd and the gift arrived to it's destination on April 24th... with NO extra charges. I am very happy with the service and will definitely use GiftTree in the future! Needless to say, the recipients were excited about their gift. My friend loved the gift! & the engraving gave the gift a nice touch. This personalized gift, proved to be the perfect wedding gift for a life long friend. The gift was well received. He loved it. The whole process, from ordering to delivering the gift, was an exceptional experience. Thank you! Gave it as a birthday gift and they loved it! Thank you very much for a gift that was very attractively packaged; of very good quality; of very pleasing appearance, heftiness, and design; and which elicited a very positive reaction from the receiver. Will certainly make future purchases from your firm. Thanks much. Nice presentation, engraving looked nice. Brother was very happy with it. Thanks. Purchased for a gift -- it was perfect! Quality product in a nice storage case! Will purchase for others in the future! I ordered 10 Engraved Wine Tool Sets with a personalize note card for our customers. I ordered them Tuesday afternoon and recieved them on Thursday morning. Amazing turn around time without paying for an expedited shipment. The bonus is that each gift is in a beautiful gift box with a ribbon which is included in the price. Beautiful Presentation and great service. GiftTree raised the bar on excellence! I just received this as a gift and wanted to see how I could buy this for my friends. What a wonderful gift idea! This has to be one of the favorite things I've gotten from a vendor. It was beautiful and she absolutely loved it! Arrived beautifully boxed and nothing better than a great price with free inscription. This was purchased as a gift and the report from the recipient was what a unique idea, now he has his own personalized corkscrew! Love this item for its unique styling and use. We bought this as a wedding gift and we couldn't be more pleased. The box, the card, the engraving...everything was perfect. I bought this for my mother-in-law and when she saw it she was delighted. Beautiful gift box and storage case. The free engraving was bonus. The ratchet action is nice. I totally got it right with this gift. I decided to purchase this for my friend, who I met almost three years ago at this point. I engraved the handle with the time and year that we met, and it really does prove to be a sentimental piece. The craftsmanship is gorgeous and the functionality is top notch. The gift was sent in a beautifully put-together box as well! Thanks GiftTree. Very impressed with the packaging and my boyfriend loved it. The engraving was a nice touch! Very nice gift, great presentation. Certainly would order again. I was the star with this gift! My friend loved it! Thank you! I had this engraved for my son for his birthday. He said the quality of all of the product, the case and the contents were awesome. He enjoys fine wine and said this is the best stuff he has ever had. He was going to Dad's house the next day and couldn't wait to show up with his engraved wine tote. You guys provided another great unusual gift that was perfect. Thank you and keep up the good work! This gift was a big hit! It was really lovely - and engraved beautifully. The recipient put it right to use. are terrfic and gifts are appreciated. Well done!